Super Bowl ads are often the most interesting – and controversial – parts of the big day. And this year is no exception. Despite the wave of cannabis legalization sweeping the country state by state, CBS decided it was too controversial to allow a marijuana Super Bowl ad. Yes, CBS turned down millions of dollars in ad revenue to keep a cannabis company off the air. Even having former Speaker of the House John Boehner on its Board of Directors was not enough for Acreage Holdings to run its 30-second spot. It seems in these highly charged times, perhaps the network was just trying to avoid controversy. CBS just wasn’t willing to be associated with the firm since cannabis is still illegal at the federal level. But even that is turning into such a technicality that last year’s Farm Bill made hemp – the other form of the cannabis plant – fully legal. CBS has indeed had its share of Super Bowl controversy too. From Beyoncé’s 2016 anti-police tinged halftime show to Janet Jackson’s 2004 wardrobe malfunction, we can almost give the network a pass on being so hesitant. Of course, it has no problem hawking beer to an audience that includes minors, but that’s another story. And “banning” the ad from the airwaves will probably do more to bring attention to it than letting it run ever could. You can check it out right here if you want to see what all the fuss is about. But the Super Bowl ad and controversy is a sign of just how mainstream cannabis is getting. Companies are ready to advertise it on the biggest – and most expensive – platform of the year. Plus, it joins Internet domain registration company GoDaddy in the “banned” ad Hall of Fame. 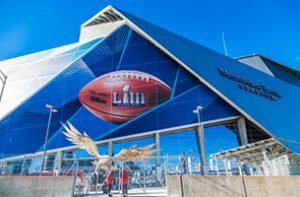 But despite CBS‘s best efforts, another cannabis ad will be seen in Mercedes-Benz Stadium on Sunday night. While Acreage will sit on the sidelines, there still will be cannabis ads at the Super Bowl, and CBS can’t stop them. These are CBD ads from Baristas Coffee Co. (OTCMKTS: BCCI), and they’ll be in the stadium on Sunday before, during, and after the game. Baristas makes EnrichaRoast CBD Coffee, and it’s one of the latest companies to find a new use for the cannabis derivative. Company CEO Barry Henthorn said that it’s difficult to advertise CBD products on some platforms, including Amazon and eBay. They have to be labeled “hemp,” not CBD. But when retailers see this year’s Super Bowl ads around the stadium, they might realize that people already know the difference between therapeutic CBD and intoxicating THC. The advertising floodgates are likely to open wide, and demand for CBD products can only grow. There is one more benefit to breaking the ice with a CBD cannabis ad. Manufacturers of complementary products, such as coffee, will see just how much money is to be made by partnering with CBD companies. CBD infused beer, candy, chocolate, soda, vapes, lotions, and pet products are already available. After all, Coca Cola Co. (NYSE: KO) and Constellation Brands Inc. (NYSE: STZ) have already taken steps toward offering CBD-infused beverages. Super Bowl advertising is a literal sign of just how mainstream CBD already is, and it’s only a matter of time before it becomes a household name. That’s why investors who jump in now are looking at a once-in-a-lifetime opportunity to invest in a growing industry before the floodgates open.